Kiddets - the sister series to The WotWots - has been a hit in China and will feature in a new Chinese theme park in Beijing and will have its own brand of yogurt in China. Sir Richard Taylor's Pukeko Pictures is set to be part of a new children's theme park in China next year. The Wellington-based animation studio has signed a deal with a Chinese trillion dollar investor in Beijing for its Kiddets preschool television show to be part of the new park, which will be set in an area about the size of Paris. This week in Beijing, Pukeko Pictures chief executive Clive Spink signed a Memorandum of Understanding to be included in the theme park. 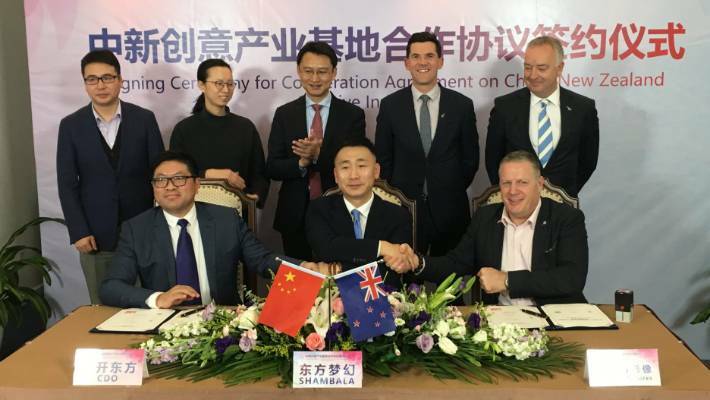 This week in Beijing, Pukeko Pictures Clive Spink chief executive, Clive Spink (front right) signed a Memorandum Of Understanding, in partnership with, Shambala Cultural Industry Investment (Blossom Pictures division) and China Development Oriental (bank). He signed with partners Shambala Cultural Industry Investment (Blossom Pictures division) and China Development Oriental, a joint venture of China Development Bank and Oriental Holdings, which has had two trillion US dollars of assets. 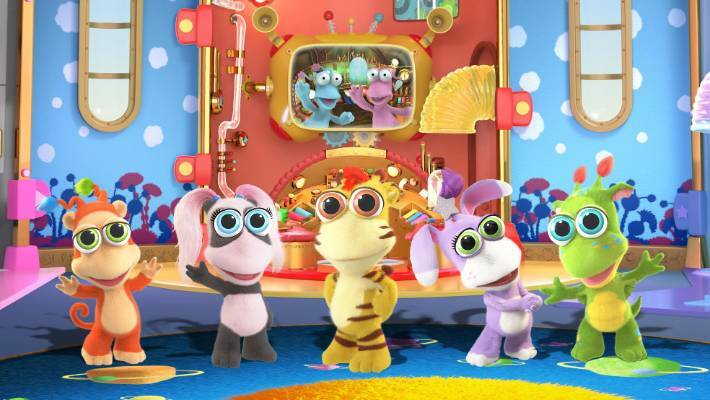 The move comes after a deal in 2015 between Pukeko Pictures and entertainment group, Guangdong Huawen Century Animation Company, to develop 'Kiddets' - a sister series to The WotWots TV show. 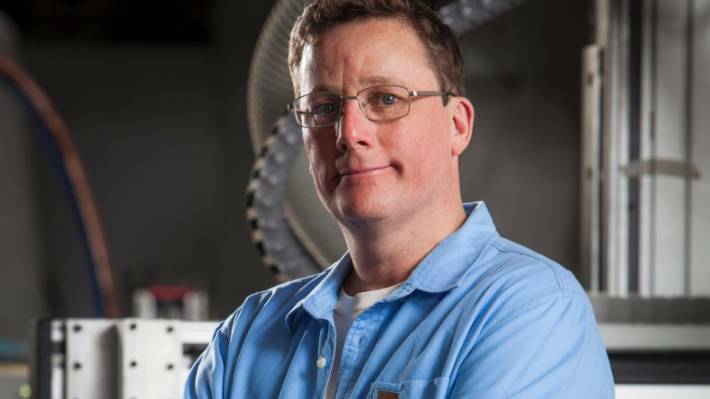 Pukeko Pictures co-owner, Sir Richard Taylor, has forged relationships in China that has led to the company's inclusion in a new theme park. A Kiddets land would be part of a theme park and digital development area at Green Dragon Lake in Beijing, Spink said. The theme park was a "location-based experience" and would be a cross between interactive museums and theatre, using Pukeko IP and new IP would also be developed. "It will include a Kiddets land, which will be an interactive play land with an education base to it and we may also develop a Thunderbirds Are Go land." 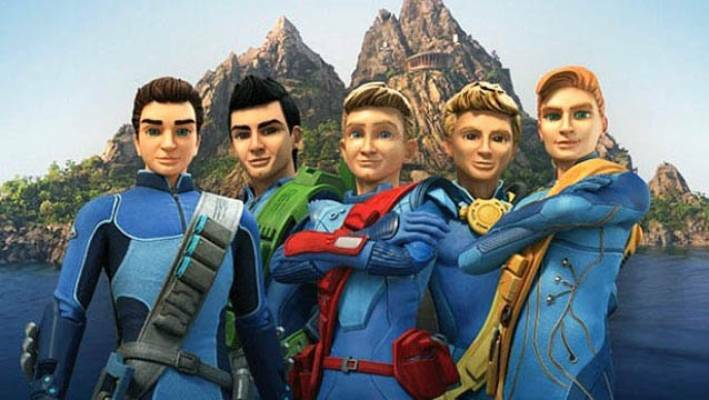 Pukeko Pictures also makes Thunderbirds Are Go, which looks likely to also feature in the Chinese theme park. Pukeko is one of the Weta Group of companies and the deal could see further collaboration and development of a number of location-based experiences with others in the group, such as Weta Workshop. For the past three years, Pukeko Pictures, in close collaboration with Jeff Wen of the Chinese entertainment company, had enjoyed collaborating in the co - production partnership, Taylor said.
" [It] has realised not only a high end sister TV series for Chinese and international children's audiences but also amazing Kiddets themed play spaces and extensive product support. This includes traditional children's toys and publishing right through to health drinks and educational support material." Taylor and Spink also recently signed an eight-year strategic deal with Wahaha​ - China's largest beverage company. The partners launched one billion bottles of Kiddets yoghurt drink (made with Fonterra product) into the Chinese market. Spink said both deals were brand extensions of the Pukeko IP. Pukeko had multiple new shows in the pipeline for its partners and Taylor expected the company would launch another multi-season show before end of this year. "These provide capacity to scale our productions (animation in particular) and an extensive network of businesses that will deliver the licensed product that will then go to China and global markets." The deal was not just for Pukeko, he said. The relationship building is also for Miramar, Wellington and New Zealand Inc and helping to build a supply chain of like-minded business that could help deliver on aspirations. Founded by China's entertainment industry veterans in 2015, Shambala media group develops digital images of intellectual properties. Its three major areas of interest are CGI development projects, distribution, virtual reality and and augmented reality development. Signing the deal, Shambala chief executive Kris Wang, said the site development had started and he hoped to see the park open next year. Green Dragon Lake was a valued and precious area of Beijing, covering about 121 km squared. His company had heavily invested in Steven Spielberg's Virtual Reality Company and a portion of the land would be used as an industrial park for digital, tech and VR industries. The first lady of China, who had met Taylor, supported the Kiddets venture, he said. "Our aim is to create a complete the production chain with digital entertainment .. and we hope Pukeko and Weta Workshop would help with this." - Collette Devlin travelled to China with assistance from the Asia New Zealand Foundation.